Dinosaur National Monument: Jurassic Park Or Jurassic Jumble? More than one thousand large fossil bones stand out in bold relief upon the rock wall at the Quarry Visitor Center in Utah's Dinosaur National Monument. The first-time visitor is stunned by the magnitude of the exhibit. The quarry face (known best as "The Wall") is surely the finest on-location dinosaur display in the world. This tangled knot of dinosaur bones represents a classic "mass burial" deposit, a trademark of what geologists call the Morrison Formation. 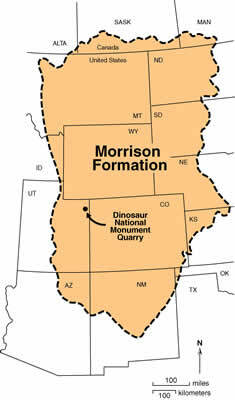 Extending from New Mexico to Canada, the Morrison Formation covers about 700 thousand square miles and has been assigned to the Jurassic System. How did such a burial take place? We seek to find the real significance of the deposit at Dinosaur National Monument (DNM) and to dispel myths that our culture has delivered to us. On the heels of the American "dinosaur rush," Earl Douglass in 1909 discovered eight articulated brontosaur tail vertebrae, standing out in relief from a sandstone ridge in eastern Utah. As digging began, he was shocked at how the skeletons turned up, literally one on top of another, and how the smaller stegosaurs "got in the way" of the prized sauropods.1 The sedimentary rock package containing the bones can be called the "Quarry sandstone," a lens-shaped pebbly sandstone up to 50 feet in thickness that is exposed for 3,000 feet along the ridge outcrop. The Quarry sandstone is composed chiefly of chert and tuff grains.2 Volcanoes certainly supplied the tuff grains, and perhaps the chert pebbles as well. 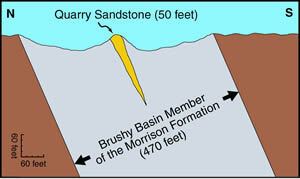 It is part of the overall 470-foot-thick Brushy Basin Member of the Morrison Formation that is dominantly mudstone. No less than a dozen well-articulated sauropods were excavated over a 15-year period ending in 1924. Probably none was more famous than the original "Brontosaurus" excavated by Douglass, that remains the most complete ever found, and that has stood in Pittsburgh's Carnegie Museum since 1915. The Quarry Visitor Center was opened officially to the public in 1958. Popular caricatures about dinosaurs can now be compared with the stark reality of the deposit itself, in an exhibit that is without parallel in the world. Of all the popular images of dinosaurs, perhaps none has been so compelling as the one featured on the front cover of Life Magazine over 50 years ago.3 The magazine displayed Brontosaurus, the snub-nosed sauropod, half-floating in the waters of a swamp and lazily munching on its lush vegetation. The artwork was derived from the Yale Peabody Museum's mural painted by artist Rudolf Zallinger after six-months of consultation with the world's top geologists.4 It had been considered fact, not speculation, that the mural and magazine cover accurately represented the world in which Brontosaurus lived 150 million years ago. 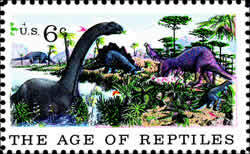 Because the purpose was to depict "The Age of Reptiles," mammals do not appear. The image became an icon so compelling that even a U.S. postage stamp bore its likeness. 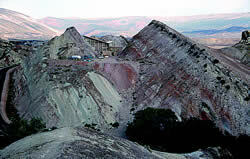 The image was derived, in a major way, from the deposit visible at the Quarry Visitor Center. Thus, the image that had been so widely embraced by the public involved a largely fictional animal in the fictional waters of a fictional swamp during a fictional age. This was the original Jurassic Park, concocted not by Hollywood, nor by creationists, but by the very scientific leaders, museum curators, and government administrators who were most familiar with the DNM deposit. We need to get the real story for the Quarry Visitor Center deposit. Recognizing the facts is important because they help us get beyond the cultural baggage and icons to develop a deeper understanding. Fact #1: The most common fossil in the Quarry sandstone is not the dinosaur, but a group of clams, of the genus Unio.9 Nearly identical forms of this clam thrive today in nonturbid and perennial fresh waters. This clam, known for a weak hinge joining its two shells, normally comes undone within days of the creature's death.10 Fossil clams at DNM are mostly disarticulated, and obviously were transported along with the big sauropod bones and other debris. Some of the loose shells are stacked, or imbricated, in a preferred west-to-east direction. Others, less commonly, are found in articulated form, that is, with the two matching shells closed and intact. These articulated clams are not in natural growth position, but represent a "transported death assemblage." In other words burial was the cause of death.11 The equivalent sedimentary layers near Grand Junction, Colorado, display a multitude of unionids, all articulated, that are recognized as having been "buried alive during an episode of rapid sedimentation. "12 That something similar happened at DNM is almost inescapable. The numbers of these clams, and their manner of burial, remind us that the real story at DNM is first and foremost, one of death, transport, and rapid burial. Fact #2: The original Brushy Basin deposit was dominated by silica-rich volcanic ash representing explosive volcanism on a colossal scale. Three products of explosive volcanoes dominate the Brushy Basin Member: (1) discrete tuff beds up to 20 inches thick containing up to half-inch-diameter volcanic fragments accumulated from air-fall ash,13 (2) reddish or greenish, fine-grained, altered volcanic ash redeposited by water in massive beds,14 and (3) pebbles of volcanic tuff and chert some over one inch diameter dispersed through the water-worked sandstone. Montmorillonite, the kind of clay formed by alteration of volcanic ash, alone accounts for over 50% of the 470-foot-thick Brushy Basin Member at DNM.15 A staggering quantity of volcanic materials, estimated at more than 4,000 cubic miles,16 occurs within the thin but widespread Brushy Basin Member in Wyoming, Utah, Colorado, New Mexico, and Arizona. No volcano is known within the boundary of the Morrison deposit, no local lava flows are known within the Morrison boundary, and geologists place the nearest explosive volcanic source vents in southern California or Nevada.17 How these coarse volcanic materials in such colossal quantities were distributed on so wide a scale remains a mystery. Imagine an exploding volcano in southern California that rained half-inch-diameter pumice and lapilli fragments on Utah and Colorado. That would be a most extraordinary eruption. Fact #3: Fossils from the DNM quarry represent a water-transported and processed assemblage, not an in situ ecosystem. We need to dispel the image of a calm and serene park for the Quarry sandstone. The remains of whole dinosaurs, unionid clams, snails, logs, and wood fragments from the Quarry sandstone all testify to some degree of transport. The more easily transported bones like ribs and phalanges are under-represented compared to less-easily transported items like femurs, which suggests the winnowing action of water. 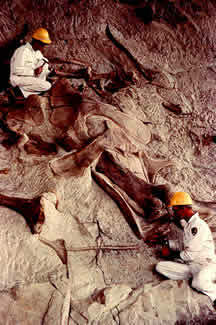 The majority of dinosaur skeletal items were buried while articulated or closely associated with a parent carcass, including some nearly complete carcasses that came to rest in stiff rigor mortis positions.18 The dismembered carcasses certainly contained tissue adhering to bone at the time of burial. Quarry invertebrates include not only the unionid clams, but also two genera of gill-breathing snails from the prosobranch family.19 Modern snails from this family, that are nearly identical to these fossil forms, require in their life-cycle waters that are (1) perennial, (2) well-oxygenated, and (3) low in turbidity. Such conditions could hardly have been met during deposition of the Quarry sandstone bed, much less the overall Brushy Basin Member. This enigma has been called "the Morrison gastropod problem. "20 The snails must also be regarded as part of the death assemblage. The fact that all of these fossil types were selectively sorted during transport from an unknown distance before burial makes very difficult the job of reconstructing an ancient "ecosystem." Fact #4: The agent that transported the clams, carcasses, clay, snails, sand, and pebbles was itself a most extraordinary sedimentary process. At the DNM quarry, the bones are found in three distinct intervals within the 50-foot-thick, channel-shaped Quarry sandstone. The three sandstone "channels" scour into the surfaces beneath, and experts have struggled to imagine the kind of "rivers" that each of the channels represent. The notion taught for decades at the Quarry Visitor Center by DNM rangers, that dinosaurs were washed up on a point bar along the bank of a meandering river, is now discredited.21 Bones are especially concentrated in the bottoms, not the sides, of the scour channels. The sand grains and pebbles in the sandstone are dominantly composed not of quartz, the typical river sediment, but of altered tuff and chert fragments of probable volcanic origin. 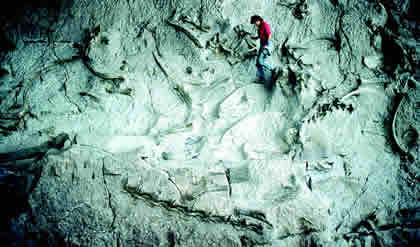 The lowest of the three levels, where dinosaur bones are most abundant, contains isolated larger pebbles dispersed in a sandy matrix, a texture unlike that of normal rivers. The texture and composition of the lower interval suggests deposition from a muddy suspension, not normal bedload transport in a river. Mudflows associated with catastrophic floods during the recent eruptions at Mount St. Helens volcano produced fluidized sediment slurries in wide river valleys and deposited similar textures.22 The upper two intervals of the Quarry sandstone, where dinosaur bones are less abundant, have noteworthy scour surfaces with cross beds of sand and pebbles indicating eastward transport of muddy and sandy sediment over large dune structures by very fast water currents. We can imagine dinosaur carcasses suspended buoyantly in a denser-than-water flow. How far they floated is unknown, but the process of suspension may have not been very abrasive. Clams, snails and logs were also moved with the volcanic pebbles and carcasses within the slurry. As deposition of sediment and carcasses occurred, the remaining flow became enriched in water going from a muddy, slurry suspension current to a less-muddy traction current. The deposit itself gives us an impression of a very catastrophic water-burial event. Fact #5: Food requirements for the giant herbivores imply abundant vegetation, yet fossil evidence for localized swamps, or for in situ flourishing of plants, is scant to nonexistent. A large herbivore like Apatosaurus would need to eat more than a ton of green fodder each day in order to survive. Large numbers of dinosaurs imply enormous food reserves in the form of plants. However, paleontologists are baffled by the rarity of fossil plants: "Although the Morrison plain was an area of reasonably rapid accumulation of sediment, identifiable plant fossils are practically nonexistent. "23 Transported logs occasionally occur in sandstone channels within the Morrison, but rooted soil zones with upright in situ stumps have not been reported, even though they are potentially the most fossilizable features in a volcanic terrain. Even fossil spores and pollen, the most durable traces of plants, are in very short supply.24 The enigma of the missing plant fossils might be answered by supposing that dinosaurs migrated routinely into a very arid plain where alkaline flats prevented plant growth. The bizarre notion of an "incomplete ecosystem" within a "Jurassic Desert" is a radical departure from the lush and balanced habitat of the elusive "Jurassic Park." Another explanation for the noteworthy deficiency of plant fossils, especially in the face of the sedimentary evidence at the Quarry Visitor Center, is that the flood transportation and deposition process selectively separated the dinosaurs from plants (i.e., sorting of "highly displaced" organisms). Fact #6: The "mass accumulation" of dinosaur bones at DNM, a sort of trademark feature for the Morrison Formation in the American West, represents a mystery that lacks satisfactory explanation. About 20 such extraordinary bone quarries exist, separated by vast reaches that are relatively devoid of bones. The lowest of the three bone-bearing intervals within "The Wall" at the visitor center represents the highest bone concentration, a packing of 2.9 bones per square meter.25 As visually stunning as this is, other large dinosaur quarries in the Morrison have bone packing that is over ten times this value. The rock types in these various quarries are quite variable, but the entombed dinosaur taxa are incredibly similar, even though the Morrison Formation covers a 700-thousand-square-mile area. So uniform are the taxa that frustrated evolutionists agree, "We failed to find any convincing evidence of evolution at the generic level within the Morrison Formation. "26 These massed accumulations, of which DNM is the most famous example, remain a geologic mystery. It is difficult to escape the conclusion that something extraordinary took place at Dinosaur National Monument. The deposit indicates enormous volcanoes, a suspension means of transport, multiple kinds of death assemblages, and a host of paleoenvironmental problems. Yet, DNM is only one of many dinosaur-massed assemblages. The above six points are hardly debatable, but are very much understated. Why does the public not receive frequent reminders of the facts so obvious within "The Wall" at DNM? Why does a coherent dinosaur "environment" seem so elusive? "Jurassic Park" is too peaceful a picture here. Clams, snails, and dismembered dinosaurs within the same deposit demonstrate a watery catastrophe. "Jurassic Jumble" is more appropriate. 5. Douglass identified the correct diplodocus-like skull for his sauropod, but was overruled by his supervisors at Carnegie Museum who deferred to an earlier, incorrect, precedent. Thus, "the size, shape, and features of the Apatosaurus head were disputed for over a century" (Encyclopaedia Britannica, 1986). 8. A claystone very near the top of the Quarry sandstone at DNM that yielded a 135.2 ± 5.5 Ma K-Ar date in 1986, gave a 152.9 ± 1.2 Ma Ar-Ar date in 1991 (Kowallis, B., et al., 1991, Age of the Brushy Basin Member of the Morrison Formation, Colorado Plateau, Western USA, Cretaceous Research, vol. 12, pp. 483-493). The age of the Morrison Formation has been "the chief point of dispute" for over 70 years as of 1944 (Stokes, W., 1944, Morrison Formation and related deposits in and adjacent to the Colorado Plateau: Geological Society of America Bulletin, vol. 55, pp. 951-992). As of 1998, "one of the significant unresolved problems related to the Morrison Formation is its age, both chronostratigraphically and biostratigraphi-cally" (Kowallis, B., et. al., 1998, The isotopic age of the Morrison Formation in the western interior; final report: in, C. Turner and F. Peterson, eds., Final Report: The Morrison Formation Extinct Ecosystems Project: unpublished report, in cooperation of the National Park Service and the U.S. Geological Survey, pp. 167-200). 11. Good, S., 1998, Bivalves as tools for paleoenvironmental analysis--Upper Jurassic Morrison Formation of the Western Interior: final report: in, C. Turner and F. Peterson, eds., Final Report: The Morrison Formation Extinct Ecosystems Project, op. cit., pp. 121-158. 20. 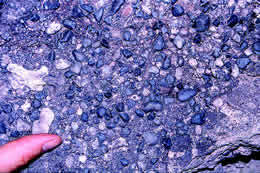 Evanoff, E., 1998, Paleoenvironmental implications of freshwater gastropod faunas in the Upper Jurassic Morrison Formation of the Western Interior--an enigma between geologic and biologic evidence; final report: in, C. Turner, and F. Peterson, eds., Final Report: The Morrison Formation Extinct Ecosystem Project, op. cit., pp. 103-104. *William Hoesch, M.S. geology, is Research Assistant in Geology, and Steven Austin, Ph.D. geology, is Chairman of the Geology Department, both at ICR. Cite this article: Various Authors. 2004. Dinosaur National Monument: Jurassic Park Or Jurassic Jumble?. Acts & Facts. 33 (4).